Should I Include Funeral Instructions in My Will? An often overlooked area of estate planning is making funeral, burial, or cremation arrangements. Under Florida law, you have the right to leave written instructions on how you want to dispose of your remains, and your wishes are binding on your family. If for any reason you choose not to leave instructions, the law authorizes your spouse to make those decisions (except in cases where your spouse is criminally responsible for your death), followed by your adult children or your next of kin. A common question we get is, “Do I need to include funeral or burial instructions in my will?” The simple answer is you can, but that may not be a good idea. A will is meant to dispose of your real and personal property. Your remains are neither. Or to put it in legal terms, your body is not part of your probate estate, so it cannot be disposed of via will. Another reason to avoid stating your funeral or burial preferences in your will is that the document may not be readily accessible. Many people leave their will with their chosen executor or a professional fiduciary such as an attorney. This means that when the person dies, their spouse or children may not have the will, so they don’t know what their loved one wanted. 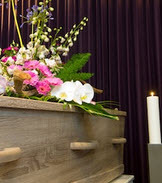 Now, Florida law does include a provision that states “any person may carry out written instructions of the decedent relating to the decedent’s body and funeral and burial arrangements” before a probate estate is opened. So if the deceased left instructions, whether in a will or a separate document, those instructions can be carried out even if the court has yet to formally appoint an executor for the estate. As we suggested above, you can leave a separate written document with your funeral or burial instructions. This is often a better approach than including such directions in your will. Indeed, if you already have a prepaid funeral plan, you should make sure your loved ones have copies of any necessary documentation. Another option is to authorize a person, known as a surrogate, to make decisions regarding the disposition of your remains after you are gone. This is normally done as part of a Florida health care directive, which is a kind of power of attorney. Basically, the surrogate steps into your place and makes any necessary decisions regarding how to handle your body, including whether or not to authorize an autopsy. It is critical to explicitly give your surrogate this authority, however, as normally a power of attorney terminates upon your death. We understand that many people don’t like to think about their own funeral arrangements. But making plans now can substantially relieve your family’s burden when the times comes. If you need advice or assistance from a qualified Fort Myers estate planning attorney, contact the Kuhn Law Firm, P.A., at 239-333-4529 today.